If you don't play fantasy football, you surely know someone who does. Either way, it's clear most fantasy football players have at least one thing in common: They don't shut up about their teams. The National Football League wants to capitalize on that trend with its latest marketing campaign featuring stars such as Victor Cruz, Odell Beckham Jr., Randall Cobb, Eddie Lacy and Antonio Brown. The fantasy category has changed significantly over the past few seasons, highlighted by the emergence of daily formats. The booming Daily Fantasy Sports (DFS) industry allows players to essentially wager real money in one-day fantasy games. DFS has been embraced, and even invested in, by the NBA and MLB. The NFL is notoriously anti-gambling and hasn't embraced DFS the way other professional leagues have. NFL.com wanted to find a way to differentiate its traditional season-long format from competitors in the DFS space such as DraftKings and FanDuel. NFL marketing svp Jaime Weston said "camaraderie through rivalry" is something you don't get when playing the daily games. "That's why people play," Weston said. "And with camaraderie comes conversation. Fantasy football gives NFL fans something dynamic to talk about. From there, we found an interesting insight around small talk—why make small talk when you can talk fantasy?" With that idea, the concept for the Grey-created "Friends Don't Small Talk, Friends Talk Fantasy" campaign was born. 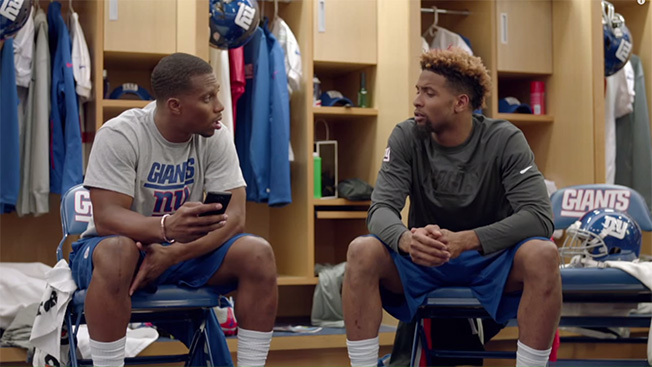 The ads feature a combination of players and fans discussing their respective fantasy squads. "Our clients are looking to get their message in front of the most engaging fans across the NFL, and many advertisers are increasingly seeing the fantasy space on the NFL digital platforms as an ideal environment to reach those fans," NFL media sales svp Brian Matthews said. Major brands are on board with the concept. Snickers and Ram Trucks have signed on to sponsor the NFL.com fantasy game, while Geico is the presenting sponsor of NFL Fantasy Live, and DirecTV, California Almonds and Lexus will have their names on an array of fantasy content. Additionally, sponsors in the telecommunications and fast-food categories are in negotiations. "One thing that we're increasingly hearing from clients is that they're looking for customized ways to be part of our fantasy game," Matthews. To that end, Snickers is sponsoring a "Most Satisfying Player of The Week Trophy," which coincides with the candy's tagline. "That's a way that we cannot just offer sponsorship, but give them something targeted to their brand, something that we build with them," Matthews said. "More and more clients are asking for something tailored to their brand objectives." In the spot above, Cruz tells his real-life teammate Beckham Jr. he's keeping him on the bench. "It's nothing personal," Cruz says before making small talk about pet cats. Another spot features a fantasy player approaching Brown at an airport, but the star wide receiver isn't amused when the fan tells him, "we crushed it last week." "We're a brand that speaks to men and women, ages 5 to 95," Weston said while explaining that a component of the campaign, including the video below, will speak specifically to female fans. "When we develop our advertising, it needs to accurately reflect our fan base." Since NFL.com launched its own game, participation has been tremendous—with double-digital percentage growth every year and 2015 forecasted to keep that pace. NFL.com Fantasy Football has grown to become more than just a platform to play the game. The site has a booming mobile app, NFL Fantasy Genius, which houses a community of players seeking advice (over 17 million answers were provided in 2014) and a Geico-sponsored digital production. "In the ad space, more and more money is shifting to mobile. We're fortunate that our traffic is flowing in that same direction. The traffic and the ad dollars are both going toward mobile," Matthews said. "But people still want to be part of the desktop experience." NFL.com Fantasy Football set a personal record with signups in 2014, and the revamped app was a key reason why. Roughly 40 percent of users signed up on a mobile device, up from 25 percent in 2013. In addition, 30 percent of all players used the mobile draft feature.